If your glasses are in multiple pieces, wrap each piece individually with a paper towel or tissue. This will help prevent your lenses from being scratched by loose pieces. 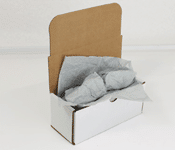 Take all wrapped pieces and wrap together and place in a small box to be shipped in. 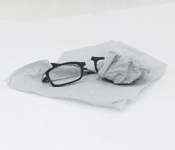 Hard eyewear cases are recommendable, but fixmyglasses does not assume responsibility for cases. 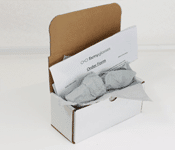 Fill excess space in box with newspaper, bubble wrap, paper towel or tissue.This will assure that the eyewear is properly processed and not bouncing around the box during transit. 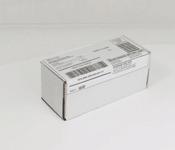 Seal box and place postage label visibly on box. It is okay to use Clear Transparent tape to tape over label.